By the Rev John Gillespie, A.M., Mouswald Manse, Dumfries. Extent of the Breed at different periods. This saying is so remote that its precise antiquity cannot be traced, but it must have originated after the term Galloway came to be employed in its restricted sense; for not only is the phrase made to exclude Ayrshire, but the sheep which produced the fine wool referred to were confined to Kirkcudbright and Wigtown. So closely were this breed of cattle identified with south Ayrshire, that in the old statistical account, and in other writings of a similar date, they are not uncommonly termed Carrick cattle. Ortelius [Mr Thomas Farrall, in his prize report on the Ayrshire breed of cattle, published in the eighth volume of the "Transactions" for 1876, quotes this statement of Ortelius as referring to Ayrshires, whereas that valuable race of milkers did not exist as a distinct breed until nearly two centuries after the time of Ortelius. The brief description which that foreign author gives of the cattle in Carrick corresponds closely with the characteristics of Galloways, and not at all with those of Ayrshires. Besides, all the native writers agree in testifying that the Galloway was the only breed in south Ayrshire until near the end of last century. It will be sufficient to give a quotation from the "View of the Agriculture of Ayrshire" by Mr Aiton, who had the best opportunities of observation, for he was for many years previous to 1785 a practical farmer in the county. In his work published in 1811 he says:—"The Galloway cow, so well known and so highly valued in the English market, was, till of late, the only breed known in Carrick, and in former ages through the whole county of Ayr ; and though the dairy breed has been lately introduced, and is fast increasing in Carrick, still the Galloway cow is most common in that district of Ayrshire" (Aiton's "View," p. 413).] the celebrated geographer and author, who wrote in 1573, says:—"In Carrick are oxen of large size, whose flesh is tender and sweet and juicy." While Galloway has from time immemorial been the home of the cattle of that name, yet they were not very numerous in any part of it until about the close of the first quarter of the eighteenth century. Previous to the union of the two kingdoms there were comparatively few cattle kept even in the arable districts, the low lands as well as the hill country being at that time stocked principally with sheep. And the explanation of this is not far to seek. The towns in Scotland were not populous, and consequently the demand for beef from them was very limited; and, moreover, in consequence of the distance of the greater portion of the wide district where Galloways were kept from the principal centres of. population, it did not participate to any considerable extent in the limited demand which did exist. The feuds between the Scotch and the English prevented any outlet even for store cattle to the other side of the border, so that cattle breeding at this period was not remunerative. From the deed of settlement of Giles Blair, Lady Row, who lived in Carrick, executed on the 31st August 1530, it appears that a cow at that time was worth 2s. 2d. sterling; an ox, 2s. 6d. ; a two-year old, 1s. 1d. ; and a stirk, 8d. Sheep were more profitable than cattle, and they were valuable mainly for their wool, for which there was a good demand at fair prices. Consequently those portions of the arable farms which were not employed for cropping purposes, as well as the high lands, were principally stocked with sheep. But the union of the two kingdoms opened up a demand for lean cattle from Norfolk and the other south-eastern counties of England, which early last century caused a speedy extension of cattle-breeding, and this was found to be much more remunerative than any system which had yet been tried. The proprietors were led to perceive the profit of having good grass on their estates, seeing that the chief revenue of those who rented their lands must be derived from cattle. With the view of reducing the extent under tillage, and correspondingly increasing the area under grass, they immediately set to work to enclose the lands with stone fences of a kind which have since been known as Galloway dykes. In doing so, they in many instances threw several farms into one, and thereby ejected a large number of tenants with their families so summarily, that not a few of them, having no other means of subsistence, soon found themselves in destitute circumstances. The process of enclosing was for a time interrupted by the popular rising of a body of men known as "The Levellers," whose lawless proceedings are matter of history. But the rising was soon quelled, and the work of enclosing and of stocking the fields with cattle went on apace. Sheep were almost entirely banished from the low grounds, the only bleaters grazed in the dales being a few pets, and these were kept for the sake of the blankets and homemade cloth, which were made from their wool by the farmers' wives. Andrew Symson, Episcopal minister at Kirkinner, who wrote his "Description of Galloway" in the end of the seventeenth century, says:—"Galloway is more plentifull of bestiall than cornes," so that the extension of cattle breeding had begun in his day. The rise in the price of cattle was rapid and great. The statement of John Maxwell of Munches, in his letter, dated 1811, to W. M. Hemes of Spottes, that in 1736 he saw 100 five-year-old cattle sold at Dumfries for £2, 12s. 6d. each, is often quoted as an illustration of the low prices obtained at that time; and so they were in comparison with what was afterwards procured, but when contrasted with the valuation which Lady Row put upon her cattle two centuries previously, the rate mentioned by Mr Maxwell seems very large. The price in 1736 was twenty-four times what it had been in 1530, and it ought to be borne in mind that the principal rise in value had taken place during the fifty years immediately preceding the date specified by Mr Maxwell. The trade of sending lean Galloway cattle to the south gradually increased in dimensions during last century, until at the close of it, and in the early portion of the present century, as many as from 20,000 to 30,000 three and four-year-old Galloway cattle were annually sent from the pastures in Dumfriesshire and Galloway to England, and principally to the counties of Norfolk and Suffolk. The adoption and gradual extension of turnip husbandry, and the application about the same time of steam power, not only did away with the trade, and led the farmers to prepare a large proportion of their cattle for the fat market, but they brought back the sheep to the arable lands, and thereby lessened the number of cattle kept, at least in proportion to the increased produce from the soil. Galloway cattle have been entirely supplanted by the Ayrshires in the native county of the latter, in Renfrewshire, and in Lanarkshire; the spotties have also driven them almost entirely from Wigtownshire, and in the stewartry of Kircudbright and Dumfriesshire this valuable and fashionable race of milkers has in a large measure taken the place of the beef-producing black-skins. So lately as 1810, Galloways were the prevailing breed in Carrick (Aiton's "View," p. 413) and in Wigtownshire the number of Ayrshires at that time was not great. Shortly thereafter, the ancient cattle were rapidly displaced in Ayrshire by the dairy cows, but it was not until after 1840 that any serious inroad was made upon their numbers in Dumfriesshire and Galloway. However, during the decade which followed that year the extension of the dairy system was very rapid, and the number of the native breed was correspondingly diminished. The depression under which the cheese trade suffered caused a slight reaction in their favour, and the number of Galloway herds has increased rather than diminished during the last few years. And they should keep who can." Now this interchange of cattle, without either party ever dreaming of paying for the beasts which they appropriated, being carried on as opportunity presented itself, the breed of cattle which had originally been the same would continue intermixed on both sides of the border. Not only were Galloways extensively kept in Cumberland, but, as we shall see by-and-by, Riggfoot and other places in that English county supplied the Cumberland Willie (160) and other strains of blood which flow in the veins of all the best Galloways now in the kingdom. While the Galloways have been largely supplanted by the Ayrshires in Scotland, they have been considerably displaced by the shorthorns in Cumberland, Northumberland, and other districts in England, where at one time they extensively prevailed. However, in recent times there has been a slight reaction in their favour on the other side of the border, and in some instances shorthorn herds have been dispersed and the blackskins put in their place. Among others who have followed this course may be specified, Sir H. B. Vane, Bart., Hutton in the Forest, Penrith, who has established a select herd of high class pedigree Galloways. An allegation has never been made in any well-informed quarter that the Galloway is not an original and distinct breed of cattle. Galloway was long celebrated for two other varieties of live stock, viz., sheep and horses, and in both instances the more prominent characteristics of each breed have been attributed to the importation of foreign stock. We have already quoted the adage, "Galloway for woo'," and in corroboration of its soundness we may cite the testimony of William Lithgow the traveller, who walked over the district in 1628. He says that Galloway sheep produced finer wool than any he had ever seen in Spain. "Nay," he continues, "the Calabrian silk had never a better lustre or a softer gripe than I have touched in Galloway on the sheep's back (Lithgow's "Travels"). From time immemorial this province possessed and acquired celebrity for a distinct breed of horses, which were deservedly much prized far and wide for their excellent qualities. Indeed previous to the middle of last century, the phrase, " A Galloway," conveyed a very different meaning from what it does at the present day, being then taken to designate, not the native cattle, but the sure-footed, hardy, and spirited little horses of the district. There is a tradition that these sheep and horses originated from animals which escaped from a vessel of the Armada, which had been wrecked on the coast. This theory may be true to the extent that the native breeds may have been improved by being crossed with animals brought from Spain in the manner indicated, but it is undoubted that both of these had acquired celebrity before that ill-fated expedition was heard of. Though the precise age of the adage referred to cannot be determined, yet it is unquestionably of older date than the Armada, and therefore Galloway wool was "familiar as a household word" before that expedition set sail from Spain. Again, Campden, whose "Britannia" was published in 1586, specifies in that work the characteristic qualities of Galloway horses. Further, these steeds must have been so widely known as to have become proverbial for their superiority in Shakespeare's days; for in King Henry IV., act ii. scene 4, Pistol says to Doll:—"Thrust him down stairs! know we not Galloway nags?" But whatever truth there may be in the tradition as to the origin of the sheep and horses of Galloway, no such theory has ever been advanced either in a written or oral form as to the origin of the distinct breed of cattle for which the province has so long been distinguished. Land of the mountain and the flood,"
and from the other having been kept at a lower elevation, and better and more frequently housed, as well as more liberally and carefully fed. The variety in colour which now prevails in West Highland herds is no objection to this theory; for while Galloways are now almost all black, many of them in former times were red and brindled, and even at the present day pure bred animals with red skins are occasionally to be met with. History of the Improvement of the Breed. The work of improving the Galloways was not begun until after there had arisen for them that demand from the southeastern counties of England to which we have referred. It is not surprising that previous to this time nothing had been done in this direction, for in addition to the stagnation which prevailed in Scotland in all departments of agricultural industry, the price which could be obtained for even the best of them was so small that there was little inducement to improve them. But the quickened demand and the greatly enhanced prices naturally led the breeders to be at the use of means to supply their southern customers with a better type of beast. There is a tradition, which is believed to be well founded, that the original Galloways were universally provided with horns (Aiton, p. 419). By what means these appendages were first got quit of in a portion of the breed there is no means of ascertaining, but it was in consequence of the graziers in the south preferring them polled that the farmers in Galloway were eventually led to select only animals without horns as breeders, and so by-and-by the race became universally polled. Dr Bryce Johnstone, in his "View of the Agriculture of Dumfriesshire," written in 1794, mentions (p. 16) that most of the Galloways at that time were polled, and that the ones which were so sold at upwards of 5 per cent. higher than those which had horns. Mr William Stewart, Hillside, in an Appendix to the above work, estimates the difference in value at as much as 20 per cent. and he says that the cattle of Annandale, at the close of the first half of the eighteenth century, were generally horned. Aiton, Smith, and Singer, who wrote their views of Ayrshire, Galloway, and Dumfriesshire at the end of the first decade of the present century, are at one in testifying that in all districts very few of the Galloways at that time had horns. No name stands out conspicuous among his fellows as having been the chief instrument in improving the Galloways at any particular period of their history. "Among Galloway farmers have arisen no enthusiasts in the profession—none who have studied it scientifically, or dedicated their talents almost exclusively to this one object. No Bakewells, no Culleys, no Collings have yet appeared in Galloway, who, with a skill the result of long study and experience, have united sufficient capital, and by the success of their experiments have made great fortunes and transmitted their names to the most distant parts of the kingdom" (Smith's "Survey of Galloway," p. 237-8). Nor was the early improvement of the breed effected by the crossing of the native cows of the province with bulls of other breeds, although it may be added that isolated experiments of this kind were tried by several persons. Webster in his "View of Galloway," published in 1794, particularises (p. 22) two such trials which had recently been made—the one by the Earl of Galloway with bulls from Westmoreland, and the other by Admiral Keith Stewart with a West Highland bull brought from Argyllshire. Aiton (p. 415) mentions a theory, but only to reject it, to the effect that it was by the use of sires from Lancashire that the breed had been vastly improved, and that it was through this cross that the horns had been got quit of in the Galloway cow. But this admixture of foreign blood was so limited in extent that it could have no perceptible influence in moulding the characteristics of the breed generally at a time when Galloways were spread over such a very wide area of country, and when there was almost no interchange of blood between one district and another. There is no reason to doubt the assertion of the last-mentioned author that "the breed was brought to its present improved state by the unremitting attention of the inhabitants in breeding from the best and handsomest of both sexes, and by feeding and management." The improvement which has been made upon them during the last fifty years has been very great, and as this is an era within the memory of living men, the history of the improvement wrought upon them during that period can be written with greater minuteness and certainty. During the second quarter of the present century, the district around Kirkcudbright and the eastern part of Wigtownshire, possessed the best and finest specimens of the breed. A band of skilful and enterprising men in these districts vied with each other in their endeavours to improve the quality of their favourite blackskins, and they were highly successful. Leading men of other localities got hulls from these districts, several landed proprietors providing bulls for use on their estates, Mr Hope Johnstone of Annandale and Sir James Graham of Netherby being among the number. About 1830 the former gentleman imported some splendid sires from Galloway, which were used in the herds of Mr Gillespie, Annanbank, and others in Upper Annandale with such beneficial results that the breeders in that district were ere long able to hold their own in the show ring at the Highland Society and other meetings against the exhibits of the men of Galloway. The best and most celebrated bull taken to Upper Annandale by Mr Hope Johnstone was known as the Castlewigg bull, from his having been the property of Mr Hathorn of Castlewigg in Wigtownshire. He gained the first prize at Dumfries in 1830, and was not only a splendid animal himself, but his produce were very remarkable for their quality. Sir James Graham had what was a novel but excellent plan to assist and encourage his tenants in their efforts after improvement. Instead of medals or money, bull calves were given by him as prizes to the Netherby tenants who showed the best lots of five yearlings and as many two-year-olds ("Field and Fern," Scotland, South, p. 312). A Cumberland tenant farmer, Mr George Graham, Riggfoot, used sires bred at Borness and other places in Galloway, which not only raised his cattle to the foremost place among herds of the breed at that time, hut his improved stock was the fountain-head of all the best Galloways which have been bred in subsequent times. Mr Graham has been termed by the Druid ("Field and Fern," p. 311-12), "the 'Black Booth' of Cumberland and the border counties," from his having done for Galloways what Booth has done for Shorthorns; and there is no doubt but that the epithet is in a large measure deserved, for to one animal in his herd almost all the best pedigree animals can be traced in uninterrupted succession. This was Cumberland Willie (160), or Borness as he was at one time called, from his having been bred by Mr Sproat, Borness, near Kirkcudbright. His sire was Galloway Lad (320). Cumberland Willie was the sire of a number of hulls which were used in the best herds of Galloways in the south of Scotland, and which were instrumental in effecting a marvellously rapid improvement upon them. These were (1) The Squire (18), which, when chief of the black harem at Meikle Culloch for three seasons, was the sire of several splendid cows which laid the foundation of Mr James Graham's celebrated herd. He was also the sire of Fergy (19), which was bred by Mr Graham, and to which some of his best stock can be traced. The Squire, after leaving Meikle Culloch, was used in the herds of Mr Walter Carruthers, Kirkhill, of Wamphray, and John Graham of Shaw with most satisfactory results. He was known in Upper Annandale under the name of the Blind Bull. (2) Black Jock of Riggfoot (66), own brother to the Squire (18), was used in the Kirkhill herd, which had a high reputation for the superiority of the young males produced in it, also in the herd of Mr Gillespie, Annanbank, whose females long took a leading position in the show-ring. (3) Brother to Mosstrooper (67),the sire of Hannah (214), which was the dam of Semiramis (703) and other cows whose produce have brought very high distinction to Mr James Graham. (4) Gaffer (162), the property of Mr James Grierson formerly of Caigton, and now of Kirkland, Dalbeattie, whose herd, long a famous one, was largely impregnated with this blood. (5) Geordie of Riggfoot (234), long the chief of the black harem at Balig, Kirkcudbright, and the sire of all the best of the celebrated old stock belonging to the Messrs Shennan. Geordie of Riggfoot was the sire of Bob Burns (235), which had such a distinguished career in the show-ring that he has been justly termed "The Nestor of Black Bulls," and not a few of whose offspring have been almost equally celebrated. And (6) Mosstrooper (296) which left his mark most permanently on the quality of the breed in subsequent times. Mr Beattie, Newbie, Annan, bought Mosstrooper when he was six years of age from Mr Gibbons, Mossband, Longtown; he won fifteen first prizes in all, and never was beaten; when in his eleventh year he was taken to the Paris show in 1856, and there occupied the premier position among the polled Galloways, and, notwithstanding his age, he attracted much attention and was greatly admired by the French, from the Emperor and Empress downwards. We have dwelt thus at length on the Cumberland Willie tribe of Galloways because they are, as we have already said, the fountain head of the greater number of pure-bred animals of this breed—alike pedigree and non pedigree ones—in the south of Scotland and the north of England. To trace his offspring further would be very much like constructing a family tree from the Herd-Book, which could be comparatively easily done, but which could not be kept within a desirable compass. It is true that fresh strains flow into the Herd-Book here and there, but these branches, according to the testimony of those best qualified' to speak, or at least the greater number of them, grew out at one time or other from the same stem, although, from their being only recently entered in the Herd-Book, the exact point where the offshoot has taken place not being chronicled cannot now be clearly traced. "in their efforts after improvement. 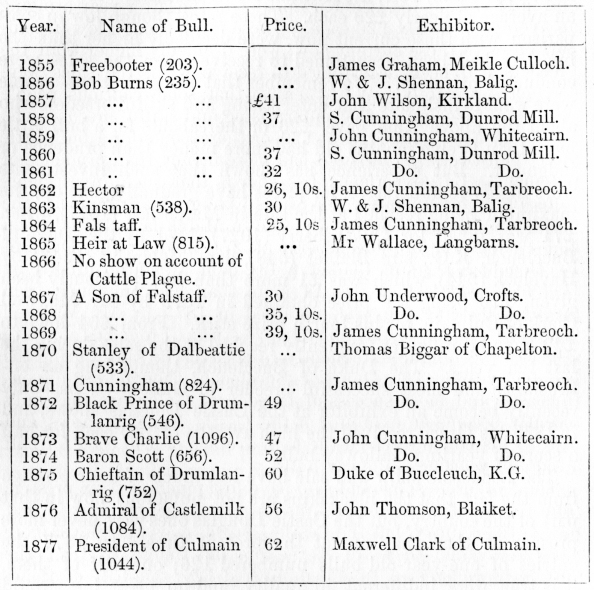 The prices realised at the first sales were much lower than those reached since; at Lockerbie in 1851 the bull stirks sold at from £10 to £16 each for the best, and secondary ones were disposed of at from £7 to £10. In 1852 eighteen were sold at an average of £11, the highest price being £22; in 1853 the first prize animal realised £21, 10s. ; and in 1854 £23, 15s. ; the Kirkhill lot in the latter year bringing an average of nearly £20 each. These rates, though low in comparison with those current now, were decidedly higher than the breeders had been accustomed to receive when the sales were conducted privately. We remember that some cautious people were wont to insinuate that enterprising and skilful breeders who about the above time gave £20 or thereabouts for a bull little more than twelve months old had more money than prudence or judgment. But experience has shown that such investments were highly remunerative, for prices have gradually gone up, the maximum being reached at the sale in March last (1877), when £71 was given for Queensberry (1027), bred by the Duke of Buccleuch, KG., sire Blaiket (548), dam Melantho (1643) by Havelock (544), which was £1 more than had previously been given, £70 being the price obtained in 1875 by Mr Maxwell Clark of Culmain, for his fourth prize stirk. From £64 down to £40 have been figures frequently reached at the sales during the last ten years. The Duke of Buccleuch, though long an enthusiastic and most successful breeder of Galloways, has only recently become an exhibitor at the Castle Douglas shows, and in 1875 his Grace received the high average of £40 each for half a score of yearling Galloway bulls. The Lockerbie show and sale have lost much of their prestige from the fact that the blackskins are not numerous now in that part of the country, but the Castle Douglas ones were never more prosperous than they are at the present time. In 1877 the entries of one-year-old bulls numbered 126; one-half of them, it is true, were indifferent in quality, and no great loss would have befallen the breed if a considerable number of them had been castrated and destined to the shambles. The excellent prices realised at the sales in preceding years tempted many breeders to keep animals as bulls which are of indifferent quality, but the unremunerative prices obtained for third-rate non-pedigree beasts will effectually check the process of over production. The other half of the yearlings exhibited at Castle Douglas in March last were really fine animals, and those placed in the prize list—14 in all—possessed in a very high degree the best characteristics of the race. The Castle Douglas Bull Show is a sort of "Derby Day" for the breeders of Galloways, as there is great emulation among them who is to produce the best male animal of the year. The prize being regarded as "the blue ribbon" of the Galloway Herd. the winner of it is regarded as a sort of chief for the season. It may be interesting to place on record the names of the winners in each year since the show was started, with the names of the successful animals, and the prices which each realised at the sale. First Prize Winners at Show of Yearling Bulls at Castle Douglas. The Galloway Agricultural Society established in October 1875 a show and sale of heifers at Castle Douglas; it has been held annually, and been moderately successful. It has afforded persons desirous of founding new herds or of recruiting old ones a favourable opportunity for procuring well-bred pedigree animals, and the prices obtained have been fairly remunerative to the breeders. "(1) To maintain unimpaired the Purity of the Breed of Cattle known as Galloway Cattle, and to promote the Breeding of these Cattle. "(2) To collect, verify, preserve, and publish in a Galloway Herd-Book the pedigrees of the said Cattle, and other useful information relating to them. "III. All Subscribers of 10s. and upwards to the Fund for the purchase of the copyright of the Galloway portion of the Polled Herd-Book shall be deemed original Members of the Society. The Managers of Subscribers of £5 and upwards shall also be deemed members. New Members may be admitted from time to time by the Council of the Society, under Rules IV. and VI. hereof, upon the payment of £1. Non-Members shall be charged double Entry Money for the animals entered by them in the Herd-Book. "IV. The affairs of the Society shall be administered by a Council, consisting of a President, Vice-President, Secretary and Treasurer (who shall be elected annually), and Fifteen other Members of the Society (who shall be elected for three years, and Five of whom shall retire annually in the order in which their names stand upon the list). "(1) To hold Meetings at such times and places as they may fix; at all Meetings of the Council Five shall be a quorum. "(2) To fix and determine the terms and conditions on which Entries may be made in the Herd-Book. "(3) To draw up from time to time Rules embodying the qualifications which Animals must possess, to entitle them to be entered in the Herd-Book. "(4) To appoint an Editorial Committee and Editor, for the purpose of collecting, verifying, and arranging the Pedigrees of Animals proposed to be entered in the Herd Book. Any person who is dissatisfied with the resolution of the Editorial Committee, as to the admission of an animal to, or its exclusion from, the Herd-Book, may appeal to the Council, whose decision shall be final. "(5) To determine the time, mode, and terms of issue of the Herd-Book, and other publications of the Society. "VI. The Annual Meeting of the Society shall be held at Dumfries, on the Second "Wednesday of June, to receive the Re-port of the Council, to Audit the Treasurer's Accounts, to fill up the Vacancies in the Council for the ensuing year/and to transact such other business as may fall to be disposed of. Extraordinary General Meetings of the Society may be called by the Council at any time. "VII. It shall not be competent to alter any of the foregoing Rules, except at a General Meeting of the Society; and notice of any proposed alteration must be lodged at least 21 days before the Meeting, in writing, with the Secretary, who shall specify it in the circular or advertisement calling the Meeting." The Duke of Buccleuch, KG., is President of the Society: The Earl of Galloway Vice-President, and Mr Maxwell of Munches Chairman of the Council. The Galloway Entries in the Polled Herd-Book have been carefully re-edited, and they are about to be issued as the first volume of the Galloway Herd-Book. Entries are being received for the second volume, [Since the above was written, vol. ii. part 1 of the Galloway Herd-Book has been published, containing 619 entries—433 females and 186 males.] for which animals are eligible without pedigree on either side, provided the Council are satisfied that they are from a pure-bred stock, but it has been resolved by the Council that only animals which have pedigree on at least one side will be admitted into future volumes. The Society has been inaugurated under highly favourable circumstances, and its formation promises to be an important era in the history of the breed. The Council has made a remit to its Editorial Committee to draw up a statement of the points of Galloway cattle. It is chiefly as a beef-producing race of cattle that the Galloways are valuable; for their milking properties are generally not of a high order. The milk given by them is rich in quality, but as a rule the quantity is not large, at all events in proportion to the size of the animal and to the food which it consumes. However, the milking faculty runs in some strains, and individuals of them are excellent dairy cows—from 10 to 13 lbs. of butter per week being occasionally got at the height of the grass when they are grazed on old pasture. However, such a yield is quite exceptional; and it cannot but be admitted, even by the most ardent admirer of the breed, that where the main object of a herd is dairy produce—either in butter or cheese, but especially the latter—the Ayrshires are preferable to the Galloways. It has been said by the author of "Field and Fern" (p. 317) that " there is no better or finer mottled beef in the world than the Galloway and Angus," and the truth of the remark has been long-placed beyond question by the fact that in the Smithfield and other leading markets it has always commanded the highest quotations. To a similar effect Mr M'Combie says, "There is no other breed worth more by the pound weight than a first class Galloway." It has been alleged in some quarters that a Galloway is rather slow in coming to maturity in comparison with some other varieties. Mr M'Combie says ("Cattle and Cattle Feeders," p.17), "Although the Galloways are such good cattle to graze, they are not so easily finished as our Aberdeen and Angus or cross-bred cattle. They have too much thickness of skin and hair, too much timber in their legs ; they are too thick in their tails, too deep in their necks, too sunken in the eye, for being very fast feeders. It is difficult to make them ripe; in many cases it is impossible, even though you keep the animals until their heads turn grey. You can bring them to be three quarters fat, and there they stick ; it is difficult to give them the last dip." While there may be some slight ground for these allegations, yet they are greatly exaggerated; and besides, it ought to be borne in mind that the Galloways have not got the same justice done to them in preparing them for the fat market as the other beef-producing breeds. It is very seldom that the feeders of Galloways have forced them to the same extent as has been done with the Angus, and consequently the distinctions which the former have won at Smithfield and other fat shows have been neither so numerous nor so great as those achieved by the north country darkies. Still in 1872 Lalla Rookh (2142), bred by Mr Biggar of Chapelton, and which had gained the first prizes as a yearling and two-year-old heifer at the Highland and Agricultural Society's Shows at Dumfries in 1870 and at Perth in 1871, carried off the first prize at Smithfield in the Polled Class. Mr M'Combie won with a Galloway bullock at Smithfield and Birmingham, and in 1861 he also took high honours—including the cup at the latter place—with a Galloway heifer bred by the Duke of Buccleuch. The feeders who have made it their aim to bring Galloways early to maturity have accomplished results which for profit will compare not unfavourably with those attained with any other breed. Mr Biggar of Chapelton, for instance, averages £1 per month for his cattle till they are disposed of at two years old. In 1866 six bullocks made £19 each when 15 months old; in 1867 four made £23 at 20 months, and in 1873 the lot made 30 guineas at 24 months. The hardiness of their constitutions, and their plentiful covering of black hair which in well bred ones is of the right sort, and which forms an excellent protection to them in their native climate, which is very moist and occasionally very cold, make them peculiarly well adapted for high lying and exposed situations. Mr M'Combie's testimony on this point is well worthy of being quoted, being the result of extensive and pretty lengthened experience. "As to the Galloway cattle, they also have had a fair trial with me. I was in the habit of buying for years from one of the most eminent judges of store Galloways in Britain— Captain Kennedy of Bennane—a lot of that breed. He selected them generally when stirks from all the eminent breeders of Galloway cattle, and bought nearly all the prize stirks at the different shows. In fact he would not see a bad Galloway on his manors. The Galloway has undoubtedly many great qualifications. On poor land they are unrivalled, except perhaps by the small Highlanders. Captain Kennedy's cattle always paid me: they were grazed on a 100-acre park of poor land—so poor indeed that our Aberdeens could not subsist upon it,"
For crossing purposes the Galloways are deservedly held in high estimation. An excellent cross—which is a special favourite with the butchers—is produced from the Galloway cow and the shorthorn bull. The colours of animals of this cross vary a good deal, but they are generally of a blueish grey. The infusion of the shorthorn blood into them tends to make them come early to maturity, and thereby counteracts the objection which Mr M'Combie has stated against the pure-bred Galloways, that they are slow to take the last dip. Moreover, their beef is of the same excellent quality as that of the breed to which their dams belong, and much superior to that of the breed of their sires: for there is considerable truth in the criticism which we have heard expressed regarding shorthorns, that "they are too much like ladies' maids—all show outside." Not a few excellent authorities use the Galloway bull for crossing with the shorthorn cow, alleging that this cross is preferable to the other. Galloway sires are also pretty extensively used for crossing with Ayrshire cows, the produce being superior beasts, which grow to a good size and weight, and come early to maturity. This cross is cultivated principally by dairy farmers who combine dairying with the rearing and in some instances also with the feeding of such cross-bred cattle. Galloway Blood in other Breeds of Cattle. There is, so far as we are aware, only one other breed of cattle which now ranks as a distinct variety of British cattle in the moulding of which Galloways have exercised if not a preponderating at least a very considerable influence. These are the Norfolk and Suffolk red-polled cattle. There is still a close resemblance in figure if not in colour between the darkies of the south west of Scotland, and the blood-red polled cattle of the above English counties. In fact the likeness is so close, that bearing in mind the fact that Galloways, many of which in former times were red and brindled in colour, were taken to Norfolk and Suffolk in large numbers in the beginning of last century, if not earlier, and also subsequently, it is not unnatural to surmise that the present race of south country red polls owe their origin at least in a large measure to the imported cattle. Mr Marshall, who resided in Norfolk from 1780 to 1782, says in his book entitled "The Rural Economy of Norfolk," that long before his time Galloway bulls were used for crossing with the Norfolk home breeds. In the recently published work on "The Cattle of Great Britain," edited by Mr Coleman, the author of the article on the "Norfolk and Suffolk Red-Polled Cattle"—himself a Norfolk man—admits that these owe their origin largely to the Galloways. He says: "From a very early period large numbers of polled Galloway cattle were brought into the counties of Norfolk and Suffolk. There can be little doubt that these were crossed with one or other (probably both) of the native races, and that thus the present breed of Norfolk and Suffolk red-polled cattle was called into existence. The writer is by no means disposed to accept the theory propounded by the author of the article on 'Scotch Polled Cattle' (in the above work), that our Norfolk polls are simply red Galloways. True enough, there is a resemblance between the heads of the two sorts, each being furnished with a red tuft of hair covering the forehead. In the Norfolk beast this appendage will, however, be. frequently composed of a mixture of red and white hair. More rarely a large spot of pure white makes its appearance in the face. The deep blood-red colour of the Norfolk polls is moreover many shades darker than we have seen in any specimens of the Galloway breed. These two peculiarities go far to support the conclusion we have arrived at—that the old native race had a due share in the concoction of the present breed." All may be conceded which this writer contends for, and yet it may be true what we have alleged, that Galloways exercised a prepondering influence in the formation of the present race of Norfolk and Suffolk polls. It is well known that the late Lord Panmure, on entering into possession of his estates in 1791, purchased eight young Galloway bulls and distributed them through Forfarshire. If the numerous produce of these eight males had been used for breeding purposes they must have exercised a great influence in moulding the breed of Angus cattle at an important period of its history, when it was admittedly in a transition state. But it has been alleged on what seems good authority, that the produce of these bulls proving very inferior, none of them were retained as breeders, and that consequently the step proved a failure. More recently several well-known breeders of Angus cattle took Galloway cows and heifers to the north, and tried the experiment of crossing them with the native bulls. Among these we may specify Betsy (124), which was bred by Mr James Gillespie, Annanbank, Lockerbie. Mr Cruickshank, Cloves, had a cow Greed (633), whose dam was Betsy (124), and whose sire was the Angus bull Vulcan (93). Greed was a first prize winner against pure-bred Aberdeen cattle, so that in her case the cross seems to have answered. Then Mr Cruickshank bred from Greed a cow, Lucy of Cloves (635), whose sire was Willie (91), a bull bred at Tillyfour. Lucy of Cloves—which was thus three parts Angus and one part Galloway.—took a prominent position in the prize list as a yearling at both Elgin and Aberdeen, so that the second cross seems to have been equally successful. The means that might be used for the improvement of Galloway Cattle. While it is undoubted that the quality of by far the greater number of Galloway cattle is decidedly better than it was twenty years ago, yet it is asserted by some that there were individual specimens of the race at that time superior in some important respects to what even the best are now. Without discussing this point, it may be freely enough conceded that improvements might be effected upon them, but it is a difficult question to determine what are the best means for bringing about that improvement. Of course the selection of proper sires and dams to breed with is a matter of first importance, and one which depends upon the skill and judgment of the breeder; and the record of the pedigrees of all the best animals in the Herd-Book will afford breeders reliable data to proceed upon in making that selection. The infusion of the blood of other breeds of cattle into the Galloways has been and is being tried, but hitherto with indifferent results. The Duke of Buccleuch has tried one experiment, and his Grace is in the course of trying another. We may tell the former in his Grace's own words: "I tried some time ago the experiment of breeding from an Angus cow and a Galloway bull, but it did not succeed, and I gave it up. I found that my object, which was to gain size, was defeated, and I lost the fineness of quality without obtaining the increase in bulk" (speech at meeting of Galloway Cattle Society at Dumfries, 24th October 1877). The other experiment which is now being tried at Drumlanrig is an important and interesting one. There can be no doubt but that there are some points in which the West Highland cattle excel the Galloways as beef-producing animals, and in these respects it is obviously desirable that the latter should be improved up to the standard of the former. With this object Mr Cranston, manager to his Grace, put a Galloway bull to two West Highland heifers having the best characteristics of the race, and the calves, both of which fortunately are heifer ones, are promising youngsters. Other heifers are this year to be used for a similar purpose. The experiment is of great importance, and may, if successful, be productive of great benefit to the breed of Galloway cattle; while if it fails to accomplish the object in view, no evil results can flow from it. The Council of the Galloway Cattle Society have resolved to enter the produce of this cross in an Appendix to the Herd-Book, so that the means of tracing and watching the success of the experiments will be within the reach of all who are specially interested in it. The best herds of Galloway cattle are becoming a good deal in-bred, and it would be of great advantage could some new blood be infused into them, and at the same time the characteristics of the breed not deteriorated but rather improved thereby.